Cutting the sleeving to length. Sleeving on thermistor. 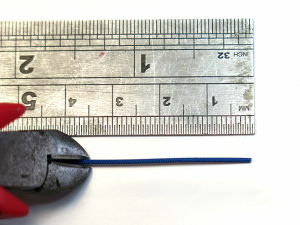 Cut the blue glass-fiber sleeving into 2 x 35mm lengths and slide them onto the legs of the thermistor. 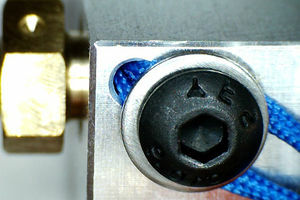 Optional: Crimp a ferrule on each leg over the sleeving (as shown in the photograph below) to ensure the sleeving stays in place. 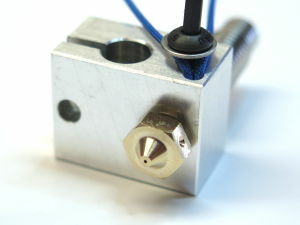 Ensure you position this ferrule such that it will not touch the heater block when assembled (you will need to place it some way from the thermistor head if you are assembling a volcano heater block). Thermistor bent into initial shape. 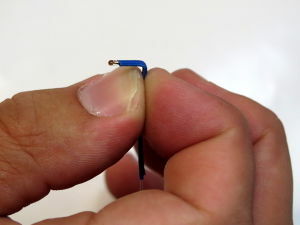 Holding the thermistor between your finger and thumb, make a 90º bend in the legs about 5mm from the tip of the bead. Thermistor bent into initial shape. Smooth and rough side of the washer. Bear in mind that due to the manufacturing process, washers often have slightly sharper edges on one of their sides. When you put the washer on the screw - make sure the smooth side is up against the sleeving to eliminate any risk of damaging the insulation. Thermistor being clamped into place. 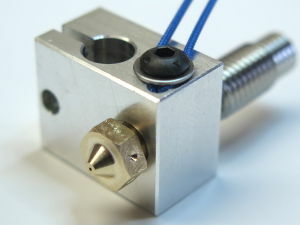 Place the of the thermistor into the hole, and fasten in place using the smaller M3x4 screw and washer. Use your fingernails to keep the sleeving under the washer whilst tightening. It should look like this when clamped. The sleeving runs into the thermistor hole insulating it right down to the glass bead. Visually check that the blue sleeving is isulating the legs of the thermistor right down to the bead. If the legs make electrical contact with the block or eachother your temperature readings will be incorrect and you risk overheating. 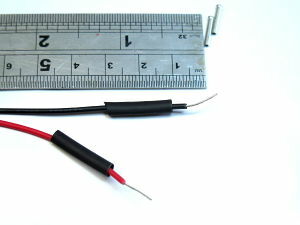 Strip the ends of the red and black thermistor cable and put a length of heatshrink over each wire. Thermistor wires formed into hooks ready to crimp. 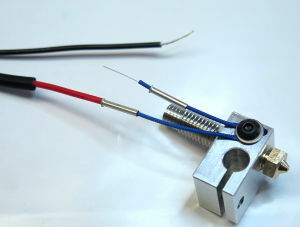 Place a ferrule on each sleeved thermistor leg, if you have the flared mouth of the ferrule pointing away from the hotend it makes it easier to push them over the wires later. 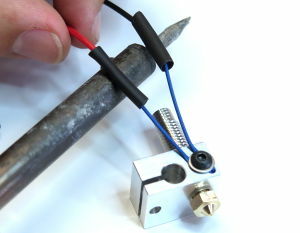 Form the thermistor wire and bare portion of the thermistor legs into hooks, and hook the legs together. Ferrule over bare portion of wires. 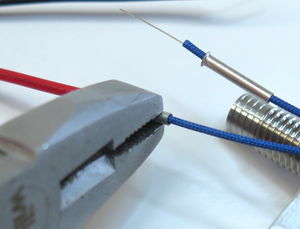 Push the ferrule over the bare portions of the wires ready to crimp into place. Crimp the ferrules by firmly crushing them with a pair of pliers. You can use a fancy ferrule crimping tool if you have one, but it's not needed. 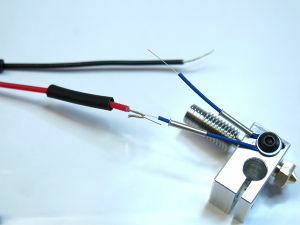 Slide the heatshrink down over the now crushed ferrules and shrink into place with a heat source such as a soldering iron, hot air gun or even a flame. This page was last modified on 24 June 2016, at 11:10.